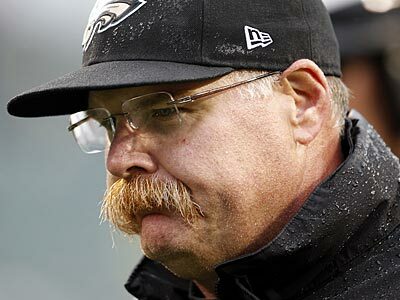 Andy Reid is the best coach of a Philadelphia professional sports team in my lifetime. Without question. And, now, after 14 highly successful years, we will have a new front man of a team so desperate to reach the top of the mountain. It was a freezing cold day (Philadelphia temperatures never broke 30 degrees) on January 11, 1999, when the Eagles announced that some no-name quarterbacks coach from the Packers (and, it is not like Brett Favre looked like the most “well-coached” quarterback to ever play…) would be their next head coach. We were coming off of a miserably forgettable 3-13 season with Ray Rhodes, and it looked as if the Birds were entering a pretty bleak period. Andy Reid’s first game with the Eagles started amazingly, as the Eagles rocketed out to a 21-0 first quarter lead over Arizona, only to blow it late, 25-24. Yesterday, was Reid’s last game with the Eagles, and, again, it started amazingly, as the team recovered a surprise onside kick on the opening kickoff, only to turn the ball over en route to another embarrasing loss – 42-7 – to the hapless New York Giants. And, in between those two games were plenty of thrilling moments that never actually led to the ultimate prize. From a list of many, many memorable moments both good and bad (brilliantly chronicled on philly.com today), I have listed 12 memories that I will most hold on to from these great (but altogether unsatisfying) 14 years. After a surprisingly encouraging 5-11 first season in Philly, Andy Reid decides to open Week One of 2000 season with a surprise onside kick in Cowboy Stadium. The Eagles recover the ball and march down the field for an opening TD. Duce Staley rushed for 201 yards, as the Birds destroyed the Cowboys, 41-14. The Eagles shocked everyone by winning the NFC East and getting Coach Reid his first of an amazing TEN playoff wins when they beat the Bucs, 21-3 in the Wild Card Round. There was just something about the “backup quarterbacks” in Reid’s tenure. Maybe because their starting quarterbacks have been rather fragile (McNabb/Vick/Kolb) over the years. Maybe it was because Reid was so good at picking (or grooming) QBs. Or, maybe the system was right for someone to step in. But, no matter what, the next guy up always stepped up. My first vivid memory of this was a Monday Night game against the juggernaut 49ers, when Koy Detmer (in for an injured McNabb) threw 2 TDs before breaking his arm. A.J. Feeley then stepped in threw another one, as the Birds cruised to a 34-14 upset of the Niners. Then there was 2006-07, when McNabb tore his ACL and Jeff Garcia came in to have a Pro Bowl season a win over the hated Giants in the playoffs and a near upset of the Saints in the Divisional Round. And, then of course, is the recent memory of just 2 years ago when Kolb went down on Opening Day and Michael Vick came in to thrill against the Packers and lead the team to a meteoric rise to another division title. Even Kevin Kolb – who did not exactly impress in his first opportunity when McNabb was benched at halftime in Baltimore in 2009 – won Player of the Week in replacement of an injured McNabb in 2009. Andy Reid was officially fired by the Eagles today and, honestly, it was a year too late. With all the talent they had assembled for last year’s team, 8-8 was just not good enough. This season’s epic failure confirmed the conclusions that many Eagles fans had already made before the 2012 team stepped on the field: it was time to move on from the Reid era. But in the wake of all the Andy-hating that has been so easy over the last couple of years, let’s not forget what he accomplished here, nor lose sight of what his legacy should be. Most “Andy Reid as Eagles coach” retrospectives will start with the day he (along with others in the front office) chose Donovan McNabb with the second pick of the 1999 draft. Reid would go into his first season with his Quarterback of the Future waiting in the wings and ready to team up with him to pull the Birds out of the downward spiral they’d been put into by Ray Rhodes. But for me, the real beginning of the Reid era was about 18 months later. I had just arrived at college to start my freshman year. A few days later, I got together with some other Eagles fans, in a dorm room, to watch the first game of the year, which happened to be against Dallas. At the time, Dallas was not too far removed from their mid-90’s dominance and they were, without a doubt, the team I hated more than any other in the world. It was still, after all, Troy Aikman and Emmitt Smith in the Cowboy backfield. The game was starting with an Eagles kickoff and, suddenly, an onside kick!?? Who starts off a game, let alone a season, with an onside kick? I’ll never forget the message I felt Andy Reid was sending, not just to the Cowboys and the NFL, but to us fans: “I may be soft-spoken and never been a head coach at any level before this job, but I am not afraid to take big risks. I’m not here to coach an average team, I’m here to do something special.” The Eagles, coming off three straight horrible seasons, recovered that onside kick and went on to win that game (in Dallas) 41-14. And I never stopped believing in Andy Reid as coach of the Eagles, until over 11 years later. Just like that, they were a playoff team in his second year. The next year, to the NFC Championship Game, where they hung tough with the “Greatest Show on Turf” Rams. They were on their way! Next step to the Super Bowl! The first bump in the road: a second straight NFC Championship, but a loss to Tampa Bay. The second-toughest loss of my life. Wasn’t the next step in this rise supposed to be WINNING the conference championship? The next year, THE toughest loss of my life, again in the NFC Championship game, this time to the Panthers. We’re stalled, we thought, but Andy and this team will get us over the top. Just a matter of time. 2004: The one thing we lacked was a big-time receiver. Andy (and yes, the front office) went and got Terrell Owens. Now we’re killing EVERYBODY. Into the playoffs, to the NFC Championship Game yet again: and we beat Atlanta (and Michael Vick)! The second-best win of my life (see: Phillies, 2008). I went rolling in the snow outside because I didn’t know what else to do. Andy’s taking us there! The Super Bowl! That was supposed to be one more step to the top. We’d stalled a bit at the Championship Game level, but now we were back on track to that first Super Bowl win. But, it turned out, that was as high as we would go. As high, it turns out, as Andy Reid could get us. After a gut-wrenching loss to the Patriots in that Super Bowl, there was a hangover season. 6 wins. And yes, we were back in the playoffs in ’06, back in that familiar NFC Title game in ’08 (after a 9-win regular season), and had an 11-5 season in ’09. But really, that upward climb, which Andy Reid had led, came to an end in Jacksonville, at Super Bowl XXXIX. I had hope that Reid could follow the path that Bill Cowher had with the Steelers, where he finally broke through with a Super Bowl win in his 14th year as their coach. It didn’t happen. I believed in Reid as an NFL coach, and I still do in many ways. He was, without a doubt, the best coach in Eagles history, even if that’s not saying a whole lot. But with 12 wins combined in the last two years, it was very clearly time to move on. It was fitting and, I suspect not a coincidence, that Andy decided to start off his LAST game the way he started the one that began that climb back in 2000: with an onside kick. Just like in 2000, the gamble worked and the Eagles recovered. But, in case anyone was mistaking this for those better times, Vick promptly threw an interception and the Eagles were on the opposite end of a rout to a division rival. I’m glad Andy Reid was fired, but I’m also glad we had him as a coach. He took the team from nowhere to as close as you can get to a championship, without getting one. And he went out, in his last game, the way he came in: unafraid and willing to do whatever it took, for better or worse, to get a win. The search is on for the man that can again pull the Eagles out of a tailspin but, maybe this time, take them all the way to the top. 15. Laurence Bowers, Sr., Missouri: After missing all of last season with a knee injury, Bowers has come back an improved player in his final season. He’s 6-8 and not very strong for a PF, but he runs the floor really well and can score inside and out. After not making a 3 in his junior year, he’s made 12 of 20 attempts this year. He was also second in the Big 12 in blocks as a junior. He’s leading the Tigers in scoring at 16 points a game, along with 6 rebounds. 14. Andre Roberson, Jr., Colorado: Inch for inch, Roberson is probably the best rebounder in the country. At just 6-7, he’s 4th in the country in rebounding, at 11.9 a game. Not an elite scorer (also 11.9 per game) but he has decent shooting range. His real value comes in other ways, mainly the rebounding, but he also blocked two shots a game last year and is averaging 2.2 steals so far this season. 13. Brandon Davies, Sr., BYU: BYU hasn’t been great as a team so far this year, but it’s hard to blame Davies. Take a look at their game Friday night: they lost by 15 to Baylor but Davies had 26 points and 17 rebounds. He fits BYU’s uptempo system perfectly, as a 6-9 PF that can really move up and down the floor. He’s averaging 20 points/8 rebounds/2 blocks this year, with highlights also including 33 points (on 14-17 shooting) vs. Weber St. and 19 points in a loss to Florida St.
12. Mike Muscala, Sr., Bucknell: It’s hard to believe that a skilled, 6-11 center can end up in the Patriot League, but maybe even harder to believe that Muscala is only the second-best player in the league this year, thanks to C.J. McCollum at Lehigh. Muscala is averaging 19 points/11 rebounds/3 assists/2.5 blocks so far this year, with some ridiculous stat lines: 29 points/19 boards vs. Columbia, 26 points/13 boards/5 blocks/4 assists/3 steals vs. Marist. He hasn’t gone up against top competition, but he did post 27 points vs. a solid Kent St. team and 18 points/7 boards/6 assists vs. La Salle. All of those aforementioned games being Bucknell wins. Yes, undoubtedly one of the top 5 pure centers in college basketball is out of the PL. 11. Nerlens Noel, Fr., Kentucky: Wait, Kentucky is a total disappointment this year and Noel is a total bust, right? Well, not quite. Noel is no Anthony Davis and he’s not, as many expected, the best freshman in the country, but he’s still very, very good and a game-changer, especially at the defensive end. In his second collegiate game he went up against Duke and put up 16 points/8 boards/4 steals. He also had 16 rebounds and 6 steals vs. a strong Baylor frontcourt. He ranks 5th in the nation with 3.9 blocks per game, to go along with his 11 points/9 boards/3 steals. He’ll continue to improve through the season, before heading off to finish his development while getting paid. 10. Elias Harris, Sr., Gonzaga: Three years ago, Harris looked like he might be a one-and-done out of Gonzaga, as a 6-8 PF that could jump out of the gym and step out to the three-point line. He elected to come back though, and went through a sophomore slump, getting tagged with an over-rated label. He may never live up to those early expectations, but the high-flying German is still a force on the college level. He hasn’t shown the outside shooting yet this year, but he’s averaging 15.5 points and 7.5 rebounds, while showing a more diversified game because he’s on pace to nearly double his career-highs in assists and steals. 9. C.J. Leslie, Jr., N.C. State: There’s been a lot of hype around Leslie since he arrived at NC State, and a lot of the time you can absolutely see why. He often looks like a future NBA All-Star with his athleticism and skill around the basket. There’s just not many defenders that can match his size and quickness. That being said, Leslie just cannot seem to turn the corner to being a consistent force. Just this weekend he went off for 33 points vs. St. Bonaventure, but he’ll often go through long stretches of games as a non-factor. Part of the problem is the sky-high expectations he’s had from Day 1, but given his ability, there’s no reason he shouldn’t be higher on this list than #9, here in his junior year. He’s averaging 15 points/7.5 rebounds. 8. Alex Len, So., Maryland: Len garnered some very early (and premature) “Player of the Year” hype in November after he put up 23 points/12 boards/4 blocks vs. Kentucky in the first game of the season. It turns out Kentucky isn’t as good as most thought at the time and Len hasn’t matched those stats since, but the 7-1, Ukrainian center is still one of the better post players in the country. He’s turned in consistently solid performances since that opening game outburst, and is averaging 14.5 points/9 boards/2.5 blocks for the 10-1 Terps. 7. James Michael McAdoo, So., North Carolina: There are a lot of reasons to not have McAdoo this high on this list: his team has been somewhat disappointing, he’s averaging over 3 turnovers (a ton for a big man), and he’s come up pretty small in the team’s biggest games this year. But I just can’t ignore the pure ability he has as a chiseled, 6-9 PF that can move like a guard. If he were to come back for a junior season (which he won’t), he would be a POY candidate in the ’13-’14 season. He’s having to make a big adjustment from 8th man last year to The Man this year, but he’s still putting up 15 and 8 a game and will continue to improve all the way to March. Maybe the biggest disappointment is that a guy with his skill-set somehow has just three blocked shots through 12 games. 6. Jack Cooley, Sr., Notre Dame: Patrick Ewing, Derrick Coleman, Alonzo Mourning, Emeka Okafor, DeJuan Blair, John Wallace. A lot of really good big men have come through the Big East, and maybe Cooley will be the very last of them. He’s often compared to another one of them: Luke Harangody. Cooley could barely get off the bench for two years before being named the league’s Most Improved Player last year. He’s taken his game up another notch this year, averaging 15 points while shooting 64% from the field, and ranking 6th in the nation in rebounding, at 11.3 a game, for the 12-1 Irish. 5. Anthony Bennett, Fr., UNLV: Cooley has taken three years to become one of the top big men in America. Bennett took about three minutes. Bennett came in highly-touted, but he’s well surpassed any expectations. At 6-8 with a dominant inside game and a reliable jump shot with range, he looks every bit like a lottery pick. He’s averaging 19.5 points and 8.5 rebounds, while also shooting 12-34 from 3, good for 35%. He’s had two of his biggest games against the best opponents he’s played, with 25 points/13 boards vs. Cal and 22 points/10 boards vs. Oregon. 4. Jeff Withey, Sr., Kansas: Withey’s career has been a lot like Cooley’s. He didn’t play for two years before finally getting his chance last year. He really put his name on the national map this past March by setting the record for blocks in an NCAA tournament, with 31 in the team’s six games. He’s shown that was absolutely no fluke, as that average of 5 blocks a game he had in the tournament is exactly his average through 11 games this season. But he’s not only a defensive presence, with his scoring average up to 14, and his FG percentage up to .573. He’s also a 7-foot shot-blocker than can knock down free throws at nearly 80%. 3. Cody Zeller, So., Indiana: Sort of by default, Zeller seemed to have been anointed as the “face” of college basketball coming into the year. He is the best player on what just MAY be the best team in the country, so if you have to choose someone, he’s a good pick. But the fact is there really is no face of the sport this year, and there may be a handful of players better than Zeller. That being said, he is an awesome collegiate center that should also be very solid, if maybe not an All-Star, at the next level. He’s averaging 16 points/8 boards for the Hoosiers, as they try to chase down a national title before he bolts for the League. 2. Doug McDermott, Jr., Creighton: McDermott is an anomaly on this list because he is not only a “capable” 3-point shooter, he is one of the best in America. He projects as a “tweener” forward at the next level, and I’m not sure he’ll be all that good there, but in college he is a match-up nightmare as a 6-8 PF that is shooting a smooth 51% (28-55) from 3 this year, and averaging 23 points, good for 3rd in the country. He will be on the short list all season for the Player of the Year award. 1. Mason Plumlee, Sr., Duke: That “best player on the best team” rationale I mentioned for Zeller above? Well, it turns out, at least through December, that that player is Plumlee. He’s yet another guy on this list that has improved by leaps and bounds. He made a big jump last year and has made an even bigger one into his senior season. He features a combination of size, agility, and skill that make him the best post player in America. He’ll command double-teams all season long. He’s averaging 19 points and 11.5 rebounds, which is good for 5th in the country. He’s led his team to an 11-0 record through the toughest schedule in the country. He had 20 points/17 boards vs. a really good Minnesota team and 21 points/17 boards vs. an even better (if a little thin in the post) Ohio St. team. Isaiah Austin/Cory Jefferson, Baylor: Austin may be a lottery pick, Jefferson has matched his production. With the conference season right around the corner, it is time to take a look at how these conference races are going to shape up. And, it is also time to check in on a new BSB project we have debuted this year. BSB’s main college basketball contributors – Doogan, Gross, and Bry – have roped in a fellow hoops junkie, Ryan Doc, to participate in our first ever CBB Team Draft. Sparing the details for a future post, essentially what we did is the four of us drafted all 344 D-I teams (leaving out the two independents – CS-Bakersfield and New Orleans – and the late entry to D-I, Northern Kentucky) in typical ladder style. The final scores will be decided by where each team finishes in their conference, which is why you see teams like Savannah State and Delaware State picked ahead of teams like Duke and Michigan State. In this post, I will try and briefly run down the races in the eight highest-rated conferences with a eye towards our CBB Team Draft and how it looks to shape up. Look for Parts Two through Four to complete the preview. Amidst all this realignment and disbandment craze, the Big East continues to churn out some of the best basketball in the nation. Personally, I think the Big Ten is actually a far better conference, but they are brought down by Nebraska and Penn State, while the Big East is bolstered by all fifteen teams being in the top 100, including three in the top 6. This should be a great year at the top of the Big East, as teams Syracuse, Louisville, Pitt, Notre Dame, Cincy, and G’town all look for real. RDoc went heavy on the Big East, as he took the first 5 BE teams off the board, finishing with 8 teams in this league, so he figures to get the 150-point prize for winning this league, though Bry’s only BE team, Pitt, might be a surprise. Savvy Picks – Bry’s nabbing of Pitt at #93 (the 6th BE team off the board) looks mighty good right now, as the Panthers are 10-1 and might have a chance to steal a big number from this conference. Providence has won 6 in a row and making a push up the standings, which looks for Doogan, who took them at #256. Of those first five that RDoc took, it looks like he’s getting the best value out of his 4th and 5th selections of Cincinnati (#39) and Georgetown (#74). Shaky Picks – This whole conference looks good, so it’s hard to say any pick was a “bad” pick, but RDoc’s picks of S.Florida (#210) and St. John’s (#234) look like they may have been reaches. Most Intriguing Battle – Marquette (Doogan – #120) and UConn (Gross – #126) were picked just 6 picks apart and each have a wide range of possible finishes. Regardless of any power rankings or whatnot, there is not anything that can convince me right now that this is not the best conference in the nation. Particularly with the emergence of 12-0 Illinois and a really solid Iowa team. Granted, Wisconsin, Northwestern, and to some extent, Michigan State have disappointed so far, but do we doubt Bo Ryan or Tom Izzo? I sure don’t. This conference is a war between Doogan and Gross, as they have 5 teams apiece in this brutal conference. RDoc is sitting out the B10 this year, while Bry took the 8th and 10th B10 teams off the board. Savvy Picks – Doogan took Minnesota at #160, as the 6th B10 team off the board, and the Gophers look like a top-10 team nationally. Bry made nice mid-conf pick, taking Illinois at #212, as the 8th B10 team off the board. While they are an impressive 12-0, it should be interesting to see if the undervalued Illini can withstand the B10 schedule. Also, Michigan looks like they might be the best team in the country, so for Gross to nab them at #54 is nice. Shaky Picks – Again, this whole conference is really good, so it is hard to find a “bad” pick, but Doogan may have reached on Northwestern at #216 and possibly even Michigan State at #33, as the 2nd B10 team picked. Gross taking Wisconsin at #107 looks like it could be a reach, but it wasn’t even a top-100 pick, and they still have Bo Ryan. Most Intriguing Battle – Iowa, Illinois, and Northwestern were all picked within 5 picks of each other (#211, 212, 216, respectively), so it should be interesting to see where they end up. It was supposed to be the year of the Wolfpack, but, instead, it looks like just another year of the Blue Devil. The Dukies look like far and away the best team in this conference, especially with UNC struggling so mightily. Va Tech was a huge surprise, but have faltered lately, while Maryland just keeps on rolling. Is it possible that the Terps are the second-best team in this conference? Yes, very possible. Gross has Duke, UNC, and Maryland, so he’s in good shape here. RDoc has a fleet of 5 solid contenders. Doogan has one team, but it is Miami – a solid contender. Bry is a non-factor, as his only ACC team was his very last pick of the draft. Savvy Picks – The two most promising picks here both could have been seen as reaches at the time of selection, but Gross with Maryland at #86 and Doogan with Miami at #88 look like really smart selections right now. RDoc also may have a steal with Virginia at #202. While, knowing what we know now, it might not look so impressive, Gross does deserve a lot of credit for making Duke the first ACC team off the board – ahead of N.C. State, who was just about everyone’s pick to win the league. Virginia Tech looked like a steal for Gross at #219 a week ago, but a lot has changed in a week. Shaky Picks – The group did pretty well analyzing the ACC finishes here, as most of the draft looks like it is going to form. RDoc taking N.C. State (#23) and Gross taking UNC (#35) so high might come back to haunt them as there may have been better options in other conference for picks so early. Another questionable pick might turn out to be Florida State at #122 for RDoc, as the Seminoles have not lived up to expectations. Most Intriguing Battle – There are a lot of intriguing battles here, as there are a lot of team pairs picked closely together – the aforementioned Duke-N.C.State battle should be interesting, as they were picked back-to-back (#22 and 23). Maryland and Miami were two picks apart (#86 and 88), and while not incredibly close to each other, the battle to avoid last-place in this conference between Gross’s Wake Forest (#318) and Bry’s Boston College (#341) could have major point implications. If you are surprised that the top 6 conferences are not the “Power-6,” then you are not paying attention. I will forgive you, though, if you are surprised at just how high the Mountain West is ranked this year. A perennially potent league is having one of its best seasons ever. The league is 71-18 in the non-conference, including four teams at 9-1 or better. The league has beaten it’s Pac-12 “big sisters” Colorado, UCLA, and USC and UW twice. There are also conference wins over Iowa State, UConn, George Mason, Illinois State, and Creighton – all either on neutral courts or true road venues. There is not a single cupcake in this league, and the top three are as good as any conference’s top 3, except maybe the Big East and Big Ten. Not surprising in any way is the fact that Bry is all over the MWC, having taken 5 of the 9 teams in this league. Doogan and RDoc each have two, and Gross is sitting this one out. Savvy Picks – While Bry has some nice-looking picks among his FIVE in this league (Boise State at #229, Colorado State at #157), RDoc’s pick of Wyoming at #250 is in the conversation for best pick of the entire draft, as things stand right now. The Cowboys are 10-0 and looking like a legitimate threat to finish in the top half, if not crack the Big Three. That is a hell of a pick. Shaky Picks – While RDoc had clearly the best pick of the league, he probably also has the worst – as things stand now – with Nevada at #183. The funny thing is that if he just switched those two picks, he would still look savvy, so just taking the total package of Wyoming and Nevada at #183 and #250, it was a nice haul. When you pick a team last in a conference, it is a little optimistic to think that they might give you good value, but Fresno State is clearly the worst team in the M-West right now, so Bry probably didn’t need to use pick #308 to take a last-place team, even if he does love this league a little too much. Most Intriguing Battle – It is hard to look at battles here, since Bry has more than half of the league, but it should be real interesting to see where his picks of Colorado State (#157) and Boise State (#229) fall among Doogan’s Air Force (#249) and RDoc’s Wyoming (#250), who were picked later. The Pac-12 is still trying to rebuild its tainted reputation after two of the worst seasons in major conference history. And, the disintegration of UCLA is not helping. What is helping, however, is that Sean Miller seems to have the rebuilding process at Arizona way ahead of schedule, and the ‘Cats look like a clear Top-10 team in the nation – which, as it looks now – should be enough to run away and hide with the Pac-12 title. There have definitely been some interesting and surprising happenings in the non-conference for the Pac-12, which has turned this draft upside down. Bry has 5 Pac-12 teams, with a couple nice picks making up for his blunder at the top. Gross has 3 teams here, including the runaway favorite, UA. Doogan and RDoc each have 2 teams, with Doogan’s having much more potential to bring some points than RDoc’s mid- and late-round picks. Savvy Picks – Doogan grabbing Oregon at #177 might be one of the most promising picks of the entire draft, as things look now. While it is no big stretch to think that the first team off the board is the favorite, the rise of Arizona and the demise of UCLA makes Gross taking Arizona at #11 look really nice right about now. Shaky Picks – One of the shakier picks of the entire draft was Gross reaching for USC at #91. That being said, they have been better as of late, so it may not be quite the disaster it appeared a couple of weeks ago. RDoc’s #215 pick of Washington looks pretty shaky, as well, but the Huskies have made a habit out of going through terrible non-conference seasons and turning it on in conference play. Most Intriguing Battle – Bry took California at #100 and Colorado at #132, and the way it looks, those two teams could engage in an interesting two-on-two battle against a pair of Doogan picks – Stanford (#80) and Oregon (#177) for some of those upper-middle positions in the Pac-12 standings. The sun in the morning, that geyser in Yellowstone, and Bill Self’s team winning the Big XII – am I leaving anything out here? Like clockwork, the Jayhawks are poised to roll through the Big XII yet again, even though Jeff Withey might be their best player. It is amazing. KU is good – don’t get me wrong – but they are also aided this year by the potential trainwrecks heading towards Austin, Waco, and Morgantown, as Texas, Baylor, and West Virginia have been among the three most disappointing teams in the country so far. Gross took 60% of the Big XII, including the favored Jayhawks, so he is likely to dominate the bounty of points here. Doogan is pinning his Big XII to K-State, RDoc is riding Texas, and Bry will roll with West Virginia (and, the irrelevant Texas Tech). Savvy Picks – The best pick of this conference appears to be Gross’s nabbing of Iowa State at #187, but he also got more value than it first appeared with Oklahoma State when he stepped up to take them at #78, with the more hyped UT, K-State, and WVU still on the board. Also – and this might sound strange – RDoc’s pick of Texas might actually turn out to be decent value at #159…or it could be a total strikeout, but it was not a bad gamble to take in the mid-rounds. Before last night’s loss to Stephen F. Austin, it looked like Gross’s Oklahoma pick (#267) was one of great value. It is still nice, but that loss is scary. Shaky Picks – Texas and West Virginia are both in dissarray, but at least they did not go all that early in this draft. Baylor did. With the #46 pick, Gross cannot be happy with the shakiness of that team in Waco. But, they do have talent, so anything is possible. Oh, and let us not forget that, while #173 may not be “early,” the Mountaineers of West Virginia are still sitting in last-place right now for Bry, which could make that a pretty bad pick. Most Intriguing Battle – Doogan grabbing Kansas State at #112 could be one of huge value, if they can finish ahead of either of Gross’s Baylor (#46) or Oklahoma State (#78) picks. The SEC is pretty spread out around our four competitors. Bry is the only one with fewer than 3 SEC teams, but his two were the 2nd and 3rd teams off the board, so he will be in play. Doogan took the 1st and 4th teams off the board (plus the last), so he should also be in play here. RDoc and Gross went back and forth for teams 5 through 13, with Gross taking 5 teams and RDoc taking 4. Savvy Picks – Ole Miss is another pick on the short list for best of the entire draft, as the Rebels like like true contenders for a top 2 or 3 finish in this 14-team league, and RDoc grabbed them all the way down at #162. He also may have hit on Alabama at #119, as they could finish top 4, if things work out as planned. RDoc continued to shine in this league with his later picks of Texas A&M (#231) and, especially, LSU (#271). Gross may have find a real diamond in the rough with Auburn all the way down at the ridiculously low #326. The Tigers may be a middle-of-the-pack team here. Shaky Picks – It is still hard to get a read of Doogan’s Tennessee (#72) and Gross’s Arkansas (#139) picks. But, I think we can say that Gross’s pick of Georgia at #203 has disaster potential, as the Bulldogs are currently 3-7 and it hasn’t exactly been against the best competition. Gross’s Vanderbilt at #235 also looks a bit high. And, then there is the #1 overall pick in the draft. Doogan went with the defending champs of Kentucky at #1, thinking – quite legitimately – that the ‘Cats should be the clear favorites to win a large (14 teams) league, which would garner the huge 140-point bounty. But, UK is reeling and Florida is rolling, so, while the ‘Cats should still bring a decent haul, it is looking less and less likely that they will return value commensurate with their #1 overall draft spot. Most Intriguing Battle – This conference has several tiers and probably the most interesting of these tiers is going to be a battle royale between Gross and RDoc for those mid-to-lower SEC positions. Gross is armed with South Carolina, Auburn, Arkansas, and possibly Georgia if they turn it around fighting with RDoc’s Alabama, Texas A&M and LSU. It could go a long way towards how their overall drafts turn out. While, as a Temple fan, the time for bemoaning our lot in this whole conference realignment ordeal will come, I would like to focus on the here and now and keep reminding myself that – if only for one season – the Owls are smack-dab in the middle of an endlessly fascinating A-10. Just looking at the KenPom rankings, after VCU (who is currently in 8th place, mind you) at 10, there are ELEVEN A-10 teams ranked between 44 and 103. And, GW sits right on the outside of that at 139. That is incredible! And, this conference season is going to be like none we have ever seen in the A-10. Buckle up, kids! The largest single point total in the whole competition (160) will be given to the one who picked the champion in the A-10. But, the incredible depth and parity of the league kept everyone away for almost 4 full rounds, until RDoc grabbed two teams rather quickly. Another two rounds went by before a flurry of three teams (2 for Bry and 1 for Doogan) came off the board in a quick 8-pick span. And, the fear of the unknown kept people away for longer until Gross finally entered the fray at #62. In the end, the league was very balanced – Bry had 5 teams; Doogan and Gross had 4 apiece; RDoc had 3 (including the first two off the board) – so, unsurprisingly, this league is going to be wide open all year. Savvy Picks – With VCU emerging as the likely favorite for the largest bounty of them all, it stands to reason that Bry taking them at #28 is going to get incredible value for his 7th-round pick. Much later, Bry grabbed Charlotte at #213 and they have looked real good against a bad non-conference schedule, so that has some real upside. However, other than the VCU 160-point potential, the best pick of this conference – as things look now – probably has to be either Doogan’s pick of Dayton at #152 or, maybe more impressive, Gross’s pick 27 spots later of LaSalle. And, then there are the late sleeper possibilities for all four of the drafters: Bry (St. Bonaventure at #244), Doogan (GW at #272), Gross (Rhode Island at #331), and RDoc (Duquesne at #338). Obviously, it is a bit of a zero-sum game with these bottom teams, as they cannot all show great value, but with these late picks and the way these four teams have played, it is not out of the question that any of them could return some great value. Shaky Picks – You can’t fault RDoc for this thought process in chasing the 160-point pot. And, there is no reason to think that he won’t still get it, but St. Louis looks like they might have been a little overrated without Majerus, so they may not return the value of the #15 overall pick. Gross’s entrance into the A-10 at #62 with UMass looks like a bit of a reach, as the Minutemen have been shaky and are in danger of a not even breaking the top 10 in the league – not great value for a 16th-round pick. Bry may have been caught up in some hard-core bias in reaching for Temple at #36, as it is still up in the air where they will finish. And, while it is hard to really downgrade any team picked at #296, but Doogan taking Fordham might come back to haunt him if, for nothing else, he left URI and Duquesne still on the table, who both have looked a little better than the Rams in the non-conference. But, again, with 295 teams off the table, it is nothing more than missed opportunity. Most Intriguing Battle – This whole conference is an intriguing battle. I know I talked about the clumping of the 11 teams within 60 spots on KenPom’s rankings, but it is even more incredible when you look closer at this four-team cluster: Temple (B-66), Dayton (D-69), LaSalle (G-70), Richmond (B-71). Four teams within 6 spots of each other, including three in a row – all the same conference. And, those four teams are split between 3 different drafters. That is nuts! Not just the Game of the Week, but quite possibly the game of the non-conference season! Two legitimate Final Four contenders face off in the desert. Sean Miller has an arsenal of freshmen big men to lean on, as well as the grizzled veteran Solomon Hill, the wise old sophomore Nick Johnson, and the senior Xavier transfer Mark Lyons to lean on. Arizona is back – and it did not take nearly as long as some people thought it would. As for Billy Donovan’s squad – it is not crazy to think that this UF’s best team since the back-to-back titles teams of nearly a decade ago. They are strong inside (Patric Young and Erik Murphy) and outside (Kenny Boynton and Mike Rosario), but most importantly, they are incredibly tough and capable on the defensive end. This might be the best defensive team in the country. This is going to be a great nightcap to a long day of hoops. There actually are not a whole lot of mid-on-mid battles this weekend, but this one should give us what we want. The Zips have a strong backcourt duo of Alex Abreu and Brian Walsh, a couple of solid swingmen in Chauncey Gilliam and Quincy Diggs, all supporting the enigmatic personality of 7’1″ manchild Zeke Marshall. Akron may be, yet again, the most overlooked mid-major around, but any road game is tough in this business, especially when that road takes you to the home of Ray McCallum, Jr. McCallum, who notoriously passed on offers from several Big Ten schools, including Michigan State, is clearly a high-major talent playing at a mid-major level. Unfortunately for the Titans, they have not exactly surrounded Ray Ray with a strong supporting cast. But, when you have a guy that is on another level, you are always tough. If you are waiting for the Florida-Zona main course late Saturday night, you will have plenty to whet your palate throughout the day. The first game of a terrific “Battle for Indiana” double-header. The Hoosiers have looked every bit the #1 team in the country so far, but has the potential to be their toughest test yet, as the Bulldogs are stacked with outside shooters – particularly the dead-eyed Rotnei Clarke – and are unafraid of anyone in the country. And, with a guy like Brad Stevens at the helm, you know Butler will be ready in every capacity. If you believe everything you hear or read, you will think that Memphis has been one of the nation’s biggest disappoinments. But, in reality, they only have 2 losses – both in Atlantis to very quality teams (VCU and Minnesota). They also left the island with a win over a good UNI team. Then, they returned home to pound Ohio U – a Sweet 16 team a year ago. But, this game could go a long way to either vindicating or discrediting the disappoinment tag affixed on Memphis so far. One of the most impressive teams this year that no one is talking about has been Belmont. They have been blitzing teams, including a 15-point win over a really good Middle Tennessee St. team last night. It is hard to say how anyone will react to going into The Fogg (just ask Colorado-yikes), but if they can handle the environment, do not be surprised if they hang with the Jayhawks. Coach Beilein returns home. I wonder if Kevin Pittsnogle will be in the building. The Mountaineers have not exactly played the way the Huggy Bear expects, but it is still a tough place to play, even for a Final Four-caliber team like Michigan and Doogan’s #1 point guard in the nation, Trey Burke. I still believe that this is the best Gonzaga team in school history. But, after that home loss to Illinois last weekend, this game is suddenly pretty important to regain some traction. And, this Wildcat team, with their athleticism and fire – even with Coach Martin – is a scary opponent for anyone right now. Another late-night treat awaits us in Berkeley, as the Golden Bears play host to Doug McDermott and the Creighton Blue Jays. Cal is not an easy place to win any year, but with a backcourt of Allen Crabbe and Justin Cobbs, Mike Montgomery’s team is typically tough this year. The Buckeyes look like one of the best teams in the country, and UNC-Asheville is rebuilding, but the Bulldogs are still relatively potent, with a strong new crop of future All-Big Southers and a highly-experienced coach in Eddie Biedenbach, who is unafraid of games like this. I would not be surprised if OSU wins by 40 or 4. Any time you have serious trouble scoring the ball, you are prone to being upset. And, that has certainly been the case for the Hoyas thus far. While WCU is only 4-6 in the early going, they have had played tough through a difficult non-conference slate, including just recently giving Illinois a run for their money in Champaign. The Pirates of ECU have been relatively untested so far this year, which means that they have stayed completely under the radar, but they do have Miguel Paul, Maurice Kemp, and URI transfer Akeem Richmond, who can all light it up. If the Heels are who we think they should be, they should handle ECU, but if they are who they have shown to be so far, they could definitely struggle. Both teams were supposed to be good to great, but probably not elite coming into the season. But, in the early going, neither of them would fall under that category. You would be hard-pressed to make a case for Marshall being “good,” let alone “great.” While Cincy, on the other hand, has put themselves in the “elite” discussion with their early season play. Sean Kilpatrick and Cashmere Wright are as good a backcourt as you will find, and Cincy is – as always – tough and physical on the defensive end. Marshall has some talent, though, and could pose a threat at home, if they ever find what they are missing. I like Mike Brey’s Irish team this year, and Purdue is in a bit of a rebuilding stage after losing so much talent to the Association recently, but the Boilers still have Terone Johnson and D.J. Byrd to go along with a pretty stellar freshman class, so this is dangerous for ND. In-state rivalries are always brutal, but this one can be especially so. The Lobos are loaded this year, but the Aggies are no slouches either, and anything can happen in these battles. Watch for State’s super-soph Daniel Mullings to try and carry his team to an upset here in The Pit. Syracuse looks really, really good. It is hard to imagine Canisius giving them a real game in the Carrier Dome, but, then again, it was hard to imagine Canisius doing anything they’ve been doing this year. They have two incredible scorers in Harold Washington and URI transfer Billy Baron (a dead-eye shooter who looks like a “coach’s son” because, well, he is one). N.C. State has been a pretty big disappoinment so far this year, but it is still so early, and maybe it is better that they do not go into ACC play with the target on their backs. Let the Dukies take the title of “favorite” for once. As for Norfolk, it’s not nearly the same team that upset Mizzou last year, as Kyle O’Quinn has left for the NBA, but they have surprised early and might be a dark horse in the MEAC race. An upset here, though, would say a whole lot more about what N.C. State is not than about what Norfolk is. Crosstown rivalries are always tricky. SDSU has talent to spare in this one, as USD is not a great team. But, again, crosstown rivalries are tricky. Obviously, because I simply used the discrete change in rankings, this list is somewhat biased towards those teams that were expected to be really bad and have proven barely mediocre. That shows that the presence of Maryland and Wyoming in the #10 spot to be pretty impressive for those two teams and the starts they have had. Teams like Charlotte, Middle Tennessee, North Dakota State, and Illinois State all went from “thought-to-be-decent” to “really good.” And, Ole Miss, who has improved from #74 in the preseason all the way to #21 now probably has seen the most subjectively impressive rise in their ranking. The opposite bias holds here in that this list is catered more towards teams that were thought to be mediocre, but have been pretty bad. Teams like Rice, Southern Utah, and Presbyterian are all really bad, when they were only considered to be slightly bad. And, then there are teams like South Dakota State, Drexel, Vanderbilt, Marshall, and UMass, who all were supposed to be pretty good, but have all shown to be just mediocre thus far. Most college campuses across the country are either gearing up for Finals Week or have already completed it and are emptying out for the mid-semester break. That means that the non-conference whirlwind of games has slowed to a crawl, as teams eye up the heavy conference slate that awaits them around the turn of the New Year. As for the Forgotten 40, there were only 4 teams that graduated from our list since the last edition, two weeks ago. The unbeaten Tigers of LSU got a single vote in this week’s AP Poll, while the similarly unbeaten Wyoming Cowboys got several after taking care of Colorado. Boise State, who was #7 on our list did get recognition after beating up on Creighton, and the Va Tech Hokies are the biggest surprise in the ACC this year, suffering their first loss this weekend, by 1 point at West Virginia. Iowa (24) – The Hawkeyes have been on this list in every installment, but never cracked the Top 10. Well, it is time. This team is officially “very good.” Aaron White is as underrated a player as you will find, and once freshman Adam Woodbury figures it out, they should be legitimately in the tournament discussion. Middle Tennessee State (11) – A 20-point beatdown of UAB and then a really big win over Ole Miss should have gotten the Blue Raiders some national attention, but we all know that a Sun Belt team needs to move mountains to get noticed. Ole Miss (2) – To the college hoops layman, a loss to the aforementioned Middle Tennessee State Blue Raiders might be a real negative on the Ole Miss resume, but a road loss to a team that is very, very good doesn’t hurt you much in the F40. If you have not yet heard the names Murphy Holloway or Marshall Henderson, just wait – you will. Belmont (3) – When you have a guard averaging over 19 ppg at almost 60% shooting (Ian Clark), you know you have a high-tempo, prolific offense, but when you have three others in double-figure scoring (Kerron Johnson -14, Trevor Noack-12, Blake Jenkins-10), you have something special. Iowa State (4) – Utah transfer Will Clyburn has been as good as advertised for the Cyclones this year, and, a road loss to in-state rival Iowa notwithstanding, Mayor Hoiberg has them rolling again with 21- and 11-point wins, respectively, over fellow F40 members BYU and Florida Gulf Coast to add to the ledger since the last time we checked in. Illinois State (1) – The reigning top dog on our list suffered through a surprisingly impressive 3-game losing streak. After a 3-point OT loss to Northwestern, the Redbirds gave Louisville everything they could handle in a 3-point loss, before returning home for a letdown 14-point loss to undefeated Wyoming. 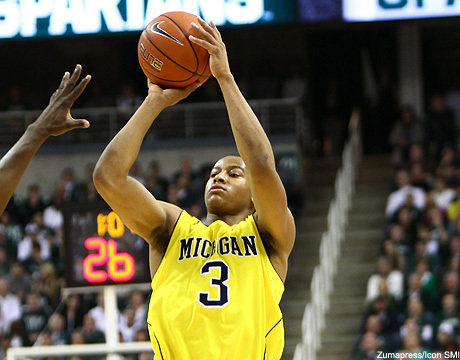 They rebounded with a 22-point shellacking of Western Michigan. It is no surprise that Jackie Carmichael is putting up huge numbers, but Tyler Brown’s are off the charts so far this year (19 ppg, 4 rpg, 2 apg, 1 spg, 50% FG, 83% FT, 41% 3pt). Virginia (5) – If you like high-flying offensive hoops, you have probably never liked Tony Bennett. But, if you want your team to win, you probably want him hired. Bennett is doing it again – in ugly fashion – at UVA, as the Cavs continue to roll on, adding relatively easy wins over MVSU, Green Bay, and the Tennessee Vols to their record. Illinois-Chicago (-) – It is finally time to take notice of what’s going on at UIC. Picked last in the Horizon, the quick start was not expected to continue, but the Flames just will not stop winning. They have now won 7 in a row, including wins at Northwestern and home against a good Colorado St. team. They sit in first-place in the Horizon, at 8-1, with their only loss coming by 7 points to an elite New Mexico team. Oregon State (12) – A 3-point loss to Alabama and a 6-point loss to Kansas are the only blemishes on the Beavers record this year. Unfortunately, they have not yet picked up any marquee wins either, so the jury is still out – and will remain out because the rest of the non-conference schedule is barren. But, the Pac-12 should be careful to underestimate the POTUS’s brother-in-law this year. Arkansas (-) – The F40’s roller-coaster team so far has got to be these Hogs. #1 on the first list, they then fell to #20 and then off completely before returning this week at #10. BJ Young and Marshawn Powell are among the best 1-2 combos in the country, and, while the 40 minutes of hell is only 4-4 this year, their losses are all close and all to good teams (Michigan, Syracuse, Wisconsin, Arizona St.). Their good wins were non-existant until they beat Oklahoma this week, making them a viable candidate to return to the Top 10 of this list. George Mason (6) – This weekend might have been the best weekend thus far in the college hoops season. Not because of the matchups, necessarily, but because of the great games. And, the best game of the weekend was Northern Iowa at George Mason. If there is a heaven – mine would probably have these two teams lining up and playing over and over again for eternity. While Mason lost in OT, they certainly acquitted themselves nicely and look like the class of a weak CAA this year. Charlotte (22) – You can only play the teams on your schedule, and that is what the 49ers have done – and won…every one of them, including an impressive road win at Davidson. In his third year on the job, it looks like Alan Major may be way ahead of schedule on the total rebuild in Charlotte. BYU (8) – The Cougars got whipped at Iowa State a couple weeks back, but rebounded to beat Utah this weekend. #12 may still be a bit high for them here, but I really like what Tyler Haws is giving them after his 2-year mission in the Phillippines, and they do still have Brandon Davies and Matt Carlino, so I am still a believer that there is enough talent for Dave Rose to put them in the tournament discussion yet again. Oklahoma (16) – The rebuild for the one and only Lon Kruger is coming along nicely in Norman. It remains to be seen if the Sooners are viable Big XII contenders, but there is no doubt they are heading in the right direction. Dayton (-) – We all know how tough the Flyers are in their building, but when they went to Alabama last week and beat the Crimson Tide, it opened some eyes. This Flyers team might be a lot better than anyone anticipated, and it is time they made their F40 debut. Clemson (15) – A home loss to Arizona is not head-scratching, but it is a missed opportunity for Brad Brownell’s team to assert itself. The Tigers looked good against one of the nation’s best, but did not have the horses down the stretch. That might be a trend of this Clemson season, but we will wait a little before dropping them here. Akron (14) – Well, a loss at Creighton is not head-scratching…but, it would have been nice if the Zips made it a little more competitive. I still believe that Akron has enough on the roster to seriously challenge Ohio in the MAC, but their non-conference has been underwhelming. Washington State (-) – I am not sure why I am so surprised that a team with Brock Motum is playing so well. Motum, one of the best pure scorers in the nation, is almost single-handedly keeping this Cougar team relevant. Canisius (-) – Canisius won 5 games last year. So, naturally, they fired their coach and hired someone else – someone coming off a whole SEVEN-win season of his own. And, you know what? It was an excellent hire. Jim Baron is a great coach, who, somehow, fell on really hard times at Rhode Island. So, when the Golden Griffins hired him to run their program, they brought in experience, wisdom, and, oh by the way, a dead-eye senior shooting guard, as Jim brought his son, Billy, with him. Billy Baron is averaging 18 ppg for Canisius. Teamed with another 18-ppg scorer, Harold Washington and last year’s starter Alshwan Hayes off the bench, Canisius may all of a sudden have the best backcourt in the MAAC. After a decent non-conference, including a win over Coach Baron’s alma mater, St. Bonaventure, the Golden Griffins have already started 2-0 in the MAAC. And, it is not your everyday 2-0, as they were both on the road against decent teams in Fairfield and Marist. All of a sudden, it is not crazy to think that a team that went 1-17 in the conference play last year and was picked dead-last in the preseason could actually win a good MAAC this year. North Dakota State (34) – Nate Who? The presumed best player in the Summit League, Nate Wolters of South Dakota State, might have to look north at another do-everything guy on a Dakota State team. NDSU’s Evan Braun is averaging 15.9 ppg, 6.4 rpg, 3.5 apg, 1.6 spg, and even 0.5 bpg on – dare I say it – the best team in the Summit League. Sorry, Jackrabbit fans, but you guys have suddenly lost the “favorite” title. Richmond (19) – Since the last time we checked in on the Spiders, they have beaten 3 CAA teams and an ACC team. Sounds good (and it is), but it was W&M in double-OT, JMU in OT, a bad ODU team, and a non-ACC caliber Wake Forest team. Still, Richmond sits at 8-2 and should be in the A-10 mix. LaSalle (-) – As if the A-10 mix wasn’t crowded enough, enter the Explorers, too. LaSalle has won 5 straight, including an OT win over Villanova and road wins over Rider and Northeastern. A sneaky team in the 16-team A-10, the Explorers get their first F40 mention, thanks to a backcourt of Tyreek Duren and Ramon Galloway, who are averaging over 34 points per game between the two of them. Pacific (-) – Another team making its debut on this list is Pacific. The next in line for “Big West Flavor of the Month,” the Tigers have beaten Nevada and San Francisco in their last two games, possibly legitimizing earlier wins over St. Mary’s and Xavier. The Big West is going to be fascinating this year, with no clear favorite whatsoever and as many as 8 truly legitimate contenders. Utah State (32) – A near tragedy at a Utah State practice last week cancelled their game with BYU, which would have showed a lot about who the Aggies are. But, as of now, they look like the WAC favorite. Robert Morris (-) – The F40 welcomes back a long-lost friend, Mr. Robert Morris. The Colonials, who were #21 on the inaugural list, started the season terribly, but three straight relatively impressive wins (Ohio, @Campbell, @Hampton) have brought them back to us and rekindled their title as NEC favorites. South Dakota State (20) – The Jackrabbits keep falling on this list, though they do remain as one of just 11 teams who have been in all four F40s. It is not exactly the 24-point loss at Minnesota that has theatened to drop them from these rankings, it is more the unimpressive home wins over bad teams like North Dakota and CS-Bakersfield. Granted, the loss to Minnesota and the 6-point win over Bakersfield were without Mr. Wolters, so I did not want to unfairly hold that against them. Stephen F. Austin (28) – The Lumberjacks debuted on the last installment, lost their undefeated status, but still moved up, as it was a decent road performance against the aforementioned Aggies of Texas A&M. Florida Gulf Coast (30) – This team may be on this list every time for the rest of the year because they will never start receiving any Top 25 votes, but they are a very, very good team. Their 15-point win over fellow mid-major stud, Loyola (Md), is just another example of how solid this team is. They even looked competitive this year on the road at Duke, VCU, St. John’s, and Iowa State. Albany (-) – The Great Danes non-conference performance has really added intrigue to the A-East. A terrific senior backcourt of Mike Black and Jacob Iat’i have Albany in the midst of a 5-game winning streak and a long-overdue appearance in the F40. SMU (40) – A win over Utah and a 26-point beatdown on the road at Hofstra has Larry Brown’s team starting to turn heads. There is very little talent on this team, but they seem to be buying into what their Hall of Fame coach is selling. Western Kentucky (-) – We all thought that Middle Tennessee State would probably have one strong challenger to the Sun Belt title, but it was supposed to be North Texas. However, it is looking more and more like it will be the Hilltoppers of Western Kentucky. They are coming off a 20-point throttling of IUPUI, but they enter a killer 3-game stretch to close out the non-conference season with games at Murray State, at VCU, and on a neutral court against Louisville. 1-2 would be a monumental success. Massachusetts (-) – Chaz Williams is listed at 5’9″, but I think 5’7″ would still be generous. And, yet, he is still averaging 15.7 ppg, 6.6 apg, and an AMAZING 5.1 rpg. He is Shawntay Rodgers reincarnated, and he also was an honorable mention on Doogan’s list of the nation’s best point guards. The Minutemen have still not put forth the results they had been hoping for, but there is no question that they have the potential to be yet another player in that crazy, crazy A-10. Weber State (-) – Thoughts of taking a step back with the departure of lottery pick (and early front-runner for NBA Rookie of the Year), Damian Lillard, have caused people to sleep on this Weber State team. But, they make their debut in the F40 this week, which corresponds to the departure of Big Sky rival Montana from the list. Yes, the official “favorite” in the Big Sky may be changing hands as we speak. New Mexico State (-) – The suddenly surging WAC puts NMSU in an interesting situation. The preseason favorite may not have it nearly as easy as they anticipated. But, the Aggies are still doing their part, with wins over Southern Miss and South Alabama over the past week giving credence to the preseason expectations placed upon Marvin Menzies’ team. La Tech (18) – One guy who could stand in the way of NMSU’s WAC title could be a 6’3″ beanpole named Raheem Appleby. Completely overlooked out of high school (most likely because, well, he weighed 139 pounds), Appelby finally got an offer from La Tech and played with a chip on his shoulder, winning the WAC’s Freshman of the Year award on the back of his 14 ppg and 2.4 rpg season. Adding 20 pounds in the offseason, Appleby has bulked up his performance, as well, currently averaging 19.2 ppg, 3.2 rpg, 1.5 apg, 1.1 spg, and 0.6 bpg. With junior running partner, Cordarius Johnson, the Bulldogs have flown out of the gates to an 8-2 start. A recent loss to Northwestern State has dropped them on this list, but that is a tough place to play, and NW State was strongly considered for this list, as well. Southern Miss (23) – Three straight losses usually would take you off this list, but the losses were all close, all on the road, and all against very solid teams – New Mexico State, Arizona, and La Tech. Their 8-point loss at Arizona, in particular, is keeping them on this list, but we will see how it all shapes up from here. Morehead State (-) – Talk about a busy substitution pattern – Morehead State has 12 players averaging at least 11.5 minutes per game this year, and all 15 players on their roster average at least 5.0. And, it is working, as the Eagles have already beaten Long Island, Lafayette, Norfolk St., and Indiana St. They even played Kentucky close at Rupp. Eastern Kentucky (-) – Another OVC team making their F40 debut is Eastern Kentucky. With every game that goes by, it gets harder and harder to dismiss this EKU team, regardless of what you might think about their non-conference schedule or level of talent. The fact is this team is 9-0. Yes, it started with a slew of home games against lower competition, but recently they have gone on the road to beat N.C. Central and Appalachian St. And, their home wins were getting more impressive, including a 24-point win over Norfolk St. and a 33-point win over Delaware St. While I may still be a “doubter,” per se, it is getting harder and harder to ignore this team. Then again, things will get clearer rather shortly, as their last 4 non-conf games are on the road, including trips to Illinois and West Virginia. While most teams here actually played their way off the list – St. John’s, Purdue, Vermont, Kent State, Loyola, Indiana State, San Francisco – others were just victims of circumstance and a crowded F40 this week. As more and more teams play their way off the list either by winning and getting noticed or losing, there will be more and more spots available for some of the deserving teams that have even been overlooked by a list designed to give attention to overlooked teams. 15. Kevin Pangos, So., Gonzaga: A guy from the WCC who’s averaging 10.6 points and 4 assists is one of the top point guards in the country? Yes. For one, this obviously isn’t your average WCC team, or even your average Gonzaga team because they are a legit Final Four contender this season. The man with the ball in his hands the vast majority of the time is Pangos, a Canadian with maybe the quickest release in the country and who’s only turned the ball over 15 times in 9 games, all Gonzaga wins. He also tends to have his best games against the toughest opponents. 14. D.J. Cooper, Sr., Ohio: This little left-hander has had quite a career already. Not only is he on his way to well over 2,000 points but he’s also already the school’s all-time leader in assists and steals. And beyond the personal achievements, he led the team to a an upset of 3-seed Georgetown as a freshman, and then led his team all the way to the Sweet 16 last year, with wins over Michigan and USF. He’s averaging 15 points/7 assists this year, and while his turnovers are high, he’s shooting 35% from 3, which is a big improvement over his career average. 13. Tray Woodall, Sr., Pittsburgh: Woodall doesn’t get the recognition he deserves, and that’s largely because of the shockingly bad season Pitt had last year, which was in large part due to Woodall being injured and not fully healthy when he did play. The Brooklyn-native was the classic NYC point guard in his first couple of years: short but quick and tough. He’s now added shooting range, shooting a shade under 40% from 3 over the last two seasons. He’s averaging 14 points this year with an assist/turnover ratio of 3.3, which is a big part of the reason Pitt leads the nation in that statistic. 12. Ray McCallum, Jr., Detroit: Definitely not your typical mid-major point guard, McCallum was a high school All-American who opted for Detroit because his dad happens to be the head coach. After leading his team to the Horizon tournament title last year, he appears to have taken his game up another notch. He’s got NBA athleticism and, so far this year, he’s showing the shooting stroke that he’ll need to match with that natural ability if he’s going to play at the next level. He’s averaging just under 20 points, along with 4.5 assists and 5 rebounds, while shooting 37% from 3, up from just 24% last season. 11. Peyton Siva, Sr., Louisville: Siva is a tough guy to place on the rankings of the top guards, partly because the statistics will never blow you away, but when you watch Louisville play and see how often they win and how important he is to everything they do, you realize he belongs in the conversation somewhere. He’s small and has never developed much of a jump shot, but he has one of the quickest first steps in the game, great vision when he gets in the lane (which is just about whenever he wants), and a constant pest at the defensive end, despite that lack of size. He’s averaging 11 points/6 assists this year. 10. Nate Wolters, Sr., South Dakota St.: It’s easy to see a guy putting up 21 points a game in the Summit League and dismiss him, but the fact is that Wolters very well might be higher on this list if he was playing in a major conference. The stats are pretty staggering, with averages so far this season of 21 points, 6 assists, 6 rebounds, and 2.5 steals. After shooting it well from 3 his first two years, he shot just 24% last year (still averaging 21 points), but that number is back up to 42% this year. And he’s done it, repeatedly, against top competition, with 19 points vs. Baylor in the tournament last year, and 30 (on 10-15 shooting) vs. Alabama in the first game of this season. 9. Keith Appling, Jr., Michigan St.: One of the things that is largely lacking from this list is shutdown, on-the-ball defenders, and with the combination of his strength and quickness, and being coached by Tom Izzo for the last few years, Appling fits the bill. He’s shown improvement across the board this year, taking over as the best player on the team from the departed Draymond Green. He’s averaging 14.5 points and continues to improve his playmaking skills. 8. Matthew Dellavedova, Sr., Saint Mary’s: A role-playing starter on the team that went to the Sweet 16 three years ago, Dellavedova is now the reigning WCC Player of the Year, and is taking his game up another notch so far in his senior year. The Australian would never be accused of being smooth, but what makes up for that with a hard-nosed style and a much-improved shooting stroke this season. He’s averaging 18.5 points/5.5 assists, while shooting 45% from 3 and 92% at the free throw line so far in 2012. 7. Pierre Jackson, Sr., Baylor: The JUCO Player of the Year two years ago, Jackson arrived at Baylor last year and made an immediate name for himself. He’s listed generously at 5-10 and will never be a totally trustworthy decision-maker, but he is an absolute blur of speed that is especially devastating in the open-court. To go along with that incredible speed with the ball, he’s also proven to be a solid perimeter shooter, even if his percentages are down so far this year. He’s averaging just under 20 points with 6.5 assists for the Bears. 6. Phil Pressey, Jr., Missouri: Coming into this season, I wouldn’t have been surprised if Pressey ended up at the top of this list, but he’s had some struggles as he adapts to life without running mates like Marcus Denmon and Kim English. In his last three games he’s shot 7-29 from the field against low-level competition, and he had 13 turnovers in back-to-back games at the Battle 4 Atlantis tourney last month. The 6-foot lefty has great quickness, maybe the best ball-handling skills in the nation, and excellent court vision. Look for the struggles he’s had to dissipate as he continues to adjust to this new team. He’s averaging 13 points/6 assists and shooting 38% from 3. 5. Marcus Smart, Fr., Oklahoma St.: The only freshman on this list, Smart is also the most unconventional point guard listed here. I was so impressed with him when I saw him for the first time this year, that I’m not even sure I can objectively rate where he belongs on this list. In that game, vs. NC State, his stat line was 20 points, 7 assists, 7 rebounds, 4 steals, and 4 blocks. The guy is a force of nature, with a body that looks more like a 25-year-old NBA player, and the athleticism to go with it. He reminds me of James Harden, only Harden played small forward in college. OK State has decided to put the ball in Smart’s hands, and it’s not hard to see why. Yes, he’s going to turn the ball over more than he should, at least this year, but he’s also averaging 13.5 points/5 assists/7.5 rebounds/2.6 steals and over a block a game. 4. Aaron Craft, Jr., Ohio St.: Craft ranked 4th on this list last year, and it kind of makes sense for him to stay in the same spot. That’s the kind of point guard he is: very steady and consistent. When it comes to the position tasked with taking care of the ball, getting it to teammates at the right place and time, and being a coach on the floor, steady and consistent is a huge asset. Craft doesn’t turn the ball over, he takes what the defense gives him as far drives to the basket or, more often, finding a teammate, and at the other end of the floor he plays arguably the best perimeter defense of any player in the country. 3. Michael Carter-Williams, So., Syracuse: No point guard’s stock has shot up through the first month of the season like Carter-Williams’. After not being able to get off the bench much a year ago, all he’s doing is leading the nation in assists (and it’s not even close, at 10.4 a game) and is 3rd in the nation in steals (3.8). And just for good measure, he’s also grabbing 5.5 rebounds a game, and chipping in 12 points. At 6-6 with pro-level athleticism, Carter-Williams is a matchup problem for most college points, and also becoming a real force at the top of Jim Boeheim’s zone defense. 2. Isaiah Canaan, Sr., Murray St.: Absolutely one of the premier scorers in college basketball, Canaan is a score-first point that led his team to a 31-2 season last year, and a win in the 1st Round of the tournament. He has the best combination in the country of quickness off the bounce and lights-out perimeter shooting. Even with every team focused on stopping him, he’s still averaging 21 points this year, while shooting 49% from the field and 43% from 3. He’s also cut down on his turnovers this year, as he works on his playmaking skills in hopes of catching on with an NBA team next year, despite his lack of size. 1. Trey Burke, So., Michigan: There was no obvious choice for the top spot on this list, but Burke gets the nod because he’s simply the most complete point guard in the country this year. Top-notch quickness? Check. Reliable jump shot? Check. Ability to ball handle in traffic? Check. Court vision? Check. Leading a title contender to an undefeated start to the season? Check. He could use some improvement defensively, but he’s not a liability there. Michigan has definitely been one of the most efficient offensive teams in the country, and so much of that is thanks to Burke and his 17 points/7 assists a game.